Get the Funk Out! : Interviewed Director Paul Lazarus about his award-winning film SLINGSHOT, now featured at the Newport Beach Film Festival! Interviewed Director Paul Lazarus about his award-winning film SLINGSHOT, now featured at the Newport Beach Film Festival! Thanks to Director Paul Lazarus who called in to my show today to chat about his latest film SLINGSHOT premiering at the 2014 NEWPORT BEACH FILM FESTIVAL! Director/Producer Paul Lazarus (Seven Girlfriends, “Pretty Little Liars,” “The Middle”) and Producer Barry Opper. 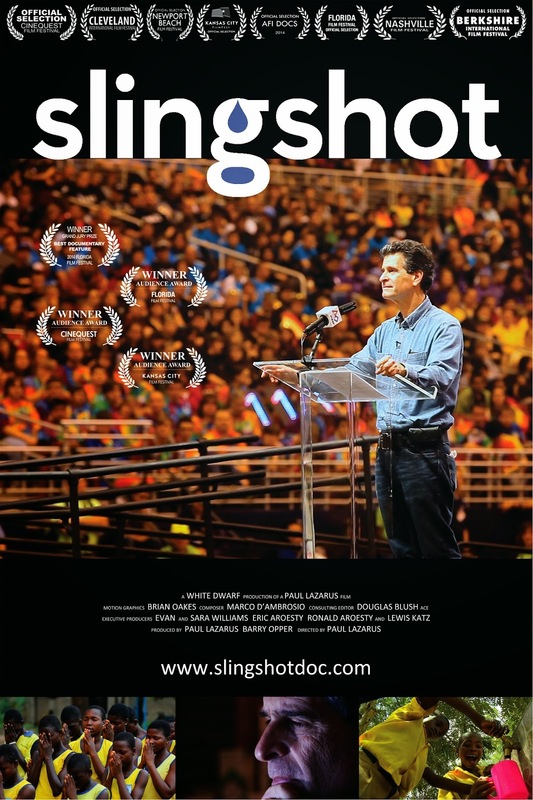 WHAT: SLINGSHOT, about award-winning inventor Dean Kamen’s 15-year quest to solve the world’s safe water crisis, at the 2014 Newport Beach Film Festival. Favorite Documentary Feature Award, at the 2014 Florida Film Festival. The film has already won three audience awards, having screened at only five festivals thus far. Q&A with the filmmakers will follow each screening. Sunday night’s screening will include a step-and-repeat for photo opps. You may not know Dean Kamen, but you're probably familiar with his inventions. His best-known creation is the Segway, an eco-friendly, two-wheeled scooter. Kamen has over 440 patents and has developed many key medical technologies, including the portable dialysis machine, insulin pumps and the Ibot, a wheel chair that can climb stairs. In 1989 he founded FIRST, a robotics competition that has enriched the lives of hundreds of thousands of kids. An iconoclast with a provocative world view, Kamen has a passion for solving problems. SLINGSHOT is his water purification device that produces clean water from any unfit source. Fifty percent of all human illness is the result of waterborne pathogens. Kamen has been on a 15-year quest to get this life-saving technology out into the world. This documentary follows Kamen as he develops the machine from idea to reality. This insightful documentary shines a light on the work of a brilliant man who is truly changing the world, one invention at a time.